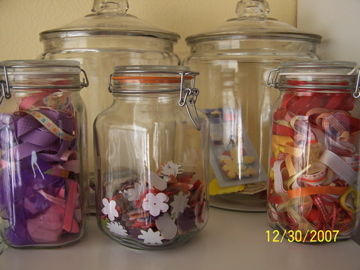 ~ Took new ribbon off rolls and put into ribbon jars. ~ Used a small gingerbread jar for all of my flowers. Took ’em all out of their packages and mixed em up in there ~ it looks so pretty! The only exception is I kept the tiny little Prima flowers in their jars, just stuck the whole jar in there (I only have 2 jars. So far….bwahahahaha). 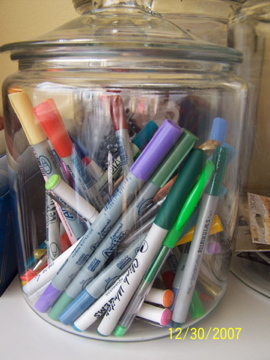 ~ Put all my pens into a small GB jar but not sure I’m gonna’ keep it that way. I took them out of 2 Creative Memories pen cases and they don’t fill up the jar enough so that the pens are standing anywhere near upright. Now a Scrapbook Obsessed person would just say…”Must buy more pens!”. 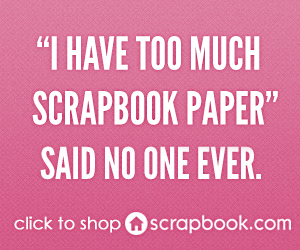 And I occasionally do, but mostly I use the ones I’ve had since I started scrapping. 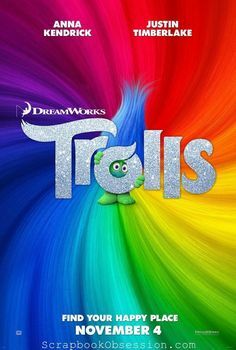 Okay, there were the glitter gel pens in Christmas colors from the Target $1 Spot recently, but that’s it, I swear! 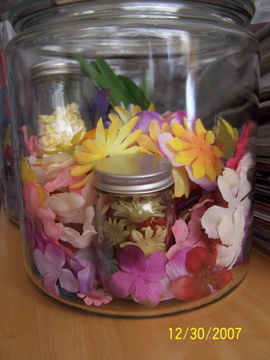 You’ll also see a jar I already had done, full of felt flowers. Those are the ones from the Target $1 Spot; that’s only $3 worth ~ what a steal! And I actually got some scrapping done tonight because I could finally see my desk. That was fun and felt really good. But I have LOTS more work to do. Hope you’re making progress too & if so, please tell us about it! Yep, It’s Snowing in Scrapperland! I Made the Scene at ScrapScene! you need to post some pictures! 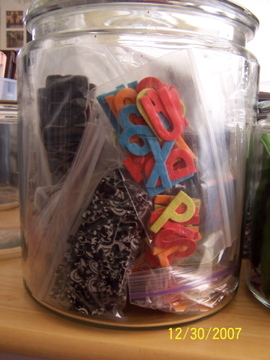 I am not sure what gingerbread jars are, but they sound cool. I moved all my scrap stuff into the living room (was prevously working out of my dining room). I set myself up a nice little corner and so far so good… it needs to be bigger but its all the room I have unfortunately. I have managed to get all the Christmas decor down in my scrap room. 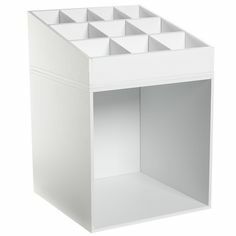 Great job on your organization! Can I ask what is a gingerbread jar??? I’ve managed to get all the L&B rail stuff up and filled. I still have some more putting away to do. I took a break from that yesterday and did a page for HOF. I was a lot more organized with the rail system though, so not so much of a mess. That’s cool. I had wanted to repaint that area, but that’s going on hold for now. My husband is going on a short deployment in about a week, so we won’t have time. I could do it myself except he painted houses to put himself through college, so he likes to do it himself. Glad to see you’re chugging along too! Have a Fantastic New Year! HI Derby ~ You’re right, I’ll post some pics now. I posted late last night and couldn’t take photos then. 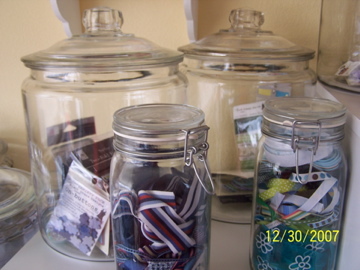 There was a past post about these jars that I got on Craigslist: http://www.scrapbookobsessionblog.com/2007/12/06/scrapbook-shopping-on-craigslistcom/. I hope your new space works out well for you. Hi Rosemary ~ Yes, I think that counts, LOL! 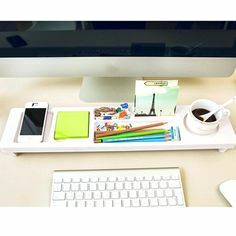 I admire that you even decorate it in the first place! It’s all I can do to get the living room/dining room done each year. Hi Julie ~ You are rockin’ this challenge! It’s great to see the photos of your progress on your blog. How exciting that you’re entering HOF ~ Best of luck! 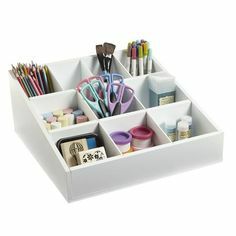 You sure have been busy organizing! 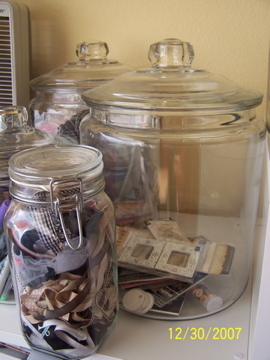 I love those jars, too. Keep up the good work! Up date: Got back from Ocean Park Washington on Monday afternoon (before actually getting home we stopped off and made my last scrapbook purchase of the year),anyways -that evening decided to get started, the end of the bed area is my Studio/Niche walking -so that had to be cleared(that is now done). Worked through to about 3am on that and the table top. Today(2nd), after taking my wooden art cabinet from underneath the table -I got to thinking…and one thing led to another and I ended up creating an “annex” for my punch drawers -they are now sitting just as you come into the bedroom. Moved my paper making barrels from under the table to the left of my space and the area underneath the table is now full with my sticker back pack, my floss container, my threads and some sewing stuff. The 3 drawer containers from JoAnns (I took them from the top of table), are now sitting down on the floor to the right of my bench seat (a very tight fit -but still workable). I think that’s it for now. Glad to see the progress you’ve made ~Erika~ I’m one of those people who doesn’t like to take stuff out of the original wrapping if I can help it -so i have to factor that in when puttind stuff away. 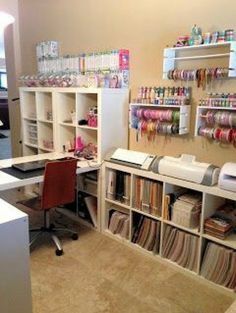 My ribbon/button/stamps/candy wrappers, etc. 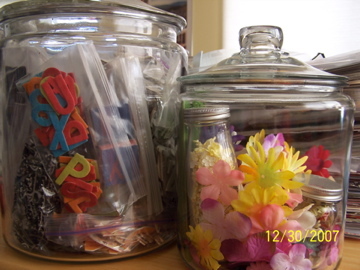 containers are the Stauffer’s 5# 4ox animal crakers and the Kirkland Signature Organic 64oz animal crackers (an FYI). I get these from Church.